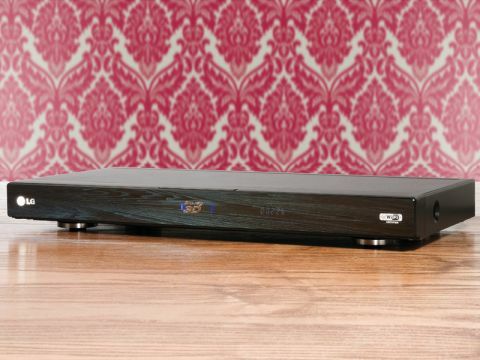 For a brand that's been aggressively at the forefront of 3D technology, and which has recently signed a much-trumpeted 'preferred TV partner' 3D deal with Sky, LG has been somewhat tardy with letting us have a look at its debut 3D Blu-ray player. But it's finally here, in the shape of the BX580, and it's a shame it's now got such an awful lot of scarily strong competition to contend with. Aesthetically it's reasonably pleasing, combining an impressively small footprint and a minimalist fascia that's actually a smokey flap, which hides a series of manual control buttons and a front-mounted USB port. Other than this, the BX580's connections run to a single v1.4 HDMI, a LAN port, both coaxial and optical digital audio outputs, a component video output, a composite video output (which I strongly recommend you don't use), and a stereo audio phono output. There are two obvious disappointments with this connection set, given that the BX580 isn't especially cheap by modern Blu-ray standards. First of all, there's only one HDMI, which could prove a problem if you've only got an AV receiver with HDMI v1.3 specification. Secondly, there are no multichannel analogue audio line-outs. To be fair, such omissions are pretty common in cheaper Blu-ray players. But the way we see it, if we don't keep bitching about them, there's more chance the same deficiencies will crop up again. While the BX580's connections might not be state-of-the-art, though, the deck is fairly robustly featured. Its headline trick, naturally, is its playback of full HD, alternate frame 3D Blu-ray discs. But it's also got built-in 802.11b/g/n Wi-Fi support (no need for external USB dongles here) for accessing Blu-ray discs' BD Live features plus networked DLNA PCs, from which it can play back an unexpectedly good selection of multimedia formats. These include JPEGs, WMA files, MP3s and numerous video formats such as: DivX HD, MKV, MP4 and AVI. The same file list can be played back from USB storage devices. If this isn't enough multimedia action for you, the BX580 can connect to LG's online NetCast platform, offering ring-fenced, streamlined access to YouTube; the Picasa online photo album site (so you can downstream your online albums to show on your TV); and the self-explanatory AccuWeather portal. This, unfortunately, adds up to a seriously malnourished set of online services compared with what's now offered online by the likes of Sony, Panasonic, Samsung and Philips. The onscreen menus used to access all the BX580's features are excellent, combining attractive presentation with a logical structure. First impressions of the BX580 in action aren't great, though. For starters, the deck takes a startlingly long time to load discs, averaging not far short of a minute for most of the titles I tried it with (such as Avatar and Iron Man 2), and hitting 52 seconds with the Tech Labs reference platter. The deck also crashed a couple of times during my tests, despite apparently having the most up-to-date firmware. Perhaps the most surprising problem I had, though, was that performance with 2D material wasn't quite as good as expected. The picture sometimes looks a touch noisy and unstable, especially with camera pans. Also, edges seemed oddly forced with really sharp HD material. These issues don't occur all the time, though. And when they're not around, picture quality is very good. Fine detail levels are decently high without looking forced, meaning you get, for instance, a sense of the deliberate grain present in Blu-rays such as 300 without it looking exaggerated. Colours are intense, but subtly crafted and believable, too, while motion is fluid without looking processed. and it's possible to get really authentic gamma and contrast from the deck with minimal tweaking of its simple picture adjustments. There's nothing much to complain about with 3D playback, either. The deck auto detects 3D discs efficiently, and delivers them cleanly. As an audio player, meanwhile, the BX580 is pretty much as I'd expect of its price level. Which is to say that it will sound perfectly adequate for mainstream users with music and soundtracks alike, but will likely sound a touch clinical and unsophisticated for audiophile tastes. In the final analysis, the BA580 is basically okay, rising into above-average territory with its multimedia chops, but feeling slightly below par with its loading times and picture performance. The BX580's biggest problem, though, is that with excellent 3D Blu-ray decks such as Sony's BDS-S570 selling for under £200 these days, being average while costing £250 might limit its appeal.